Norman, David J. 2018. Transnational civil society and informal public spheres in the nuclear non-proliferation regime. European Journal of International Relations, p. 135406611877483. Agné, Hans 2018. Why does global democracy not inspire explanatory research? Removing conceptual obstacles toward a new research agenda. Journal of International Political Theory, p. 175508821880165. Erman, Eva 2018. The Political Legitimacy of Global Governance and the Proper Role of Civil Society Actors. Res Publica, Vol. 24, Issue. 1, p. 133. Hrubec, Marek and Uhde, Zuzana 2018. Global Conflicts and Local Interactions: Contradictions of Global Capitalism and Civil Society. Critical Sociology, p. 089692051879888. Felicetti, Andrea and Castelli Gattinara, Pietro 2018. Toward an assessment of marginality in democratic systems: The Charlie Hebdo debate in the United Kingdom. The British Journal of Politics and International Relations, Vol. 20, Issue. 2, p. 497. Erman, Eva 2018. The Democratization of Global Governance through Civil Society Actors and the Challenge from Political Equality. Critical Sociology, p. 089692051879065. Slaughter, Steven 2018. Global Encyclopedia of Public Administration, Public Policy, and Governance. p. 2394. Slaughter, Steven 2017. Global Encyclopedia of Public Administration, Public Policy, and Governance. p. 1. Chambers, Simone 2017. Balancing epistemic quality and equal participation in a system approach to deliberative democracy. Social Epistemology, Vol. 31, Issue. 3, p. 266. Elstub, Stephen Ercan, Selen and Mendonça, Ricardo Fabrino 2016. Editorial introduction: The fourth generation of deliberative democracy. Critical Policy Studies, Vol. 10, Issue. 2, p. 139. Slaughter, Steven 2015. Building G20 Outreach: The Role of Transnational Policy Networks in Sustaining Effective and Legitimate Summitry. Global Summitry, Vol. 1, Issue. 2, p. 171. O'Flynn, Ian 2015. Deliberative Democracy for a Great Society. Political Studies Review, Vol. 13, Issue. 2, p. 207. Owen, David and Smith, Graham 2015. Survey Article: Deliberation, Democracy, and the Systemic Turn. Journal of Political Philosophy, Vol. 23, Issue. 2, p. 213. O'Flynn, Ian and Curato, Nicole 2015. Deliberative democratization: a framework for systemic analysis. Policy Studies, Vol. 36, Issue. 3, p. 298. Dunne, Tim and Little, Richard 2014. Guide to the English School in International Studies. p. 91. Valentini, Laura 2014. No Global Demos, No Global Democracy? A Systematization and Critique. Perspectives on Politics, Vol. 12, Issue. 04, p. 789. Isakhan, Benjamin and Slaughter, Steven 2014. Democracy and Crisis. p. 1. Crawford, Louise Helliar, Christine Monk, Elizabeth and Veneziani, Monica 2014. International Accounting Education Standards Board: Organisational legitimacy within the field of professional accountancy education. Accounting Forum, Vol. 38, Issue. 1, p. 67. Leong, Shane Hazelton, James Taplin, Ros Timms, Wendy and Laurence, David 2014. Mine site-level water reporting in the Macquarie and Lachlan catchments: a study of voluntary and mandatory disclosures and their value for community decision-making. Journal of Cleaner Production, Vol. 84, Issue. , p. 94. Global Democratization: Soup, Society, or System? 1 Keohane, Robert O., “Accountability in World Politics,” Scandinavian Political Studies 29 (2006), p. 75. 2 Gutmann, Amy and Thompson, Dennis, Democracy and Disagreement (Cambridge, Mass. : Harvard University Press, 1996). 3 Obama, Barack, The Audacity of Hope: Thoughts on Reclaiming the American Dream (New York: Crown Publishers, 2006), p. 92. 4 Leib, Ethan J. and He, Baogang, eds., The Search for Deliberative Democracy in China (Basingstoke, UK: Palgrave Macmillan, 2006). 5 Sen, Amartya, “Democracy and Its Global Roots: Why Democratization Is Not the Same as Westernization,” New Republic October 6, 2003, pp. 28–35. 6 Smith, William and Brassett, James, “Deliberation and Global Governance: Liberal, Cosmopolitan, and Critical Perspectives,” Ethics & International Affairs 22 (2008), p. 89. 7 Marion Young, Iris, Justice and the Politics of Difference (Princeton, N.J.: Princeton University Press, 1990). 8 Popper, Karl R., The Open Society and Its Enemies (London: Routledge and Kegan Paul, 1966); and Lindblom, Charles E., The Intelligence of Democracy: Decision Making Through Mutual Adjustment (New York: Free Press, 1965). 9 Keohane, “Accountability in World Politics,” p. 78. 10 Payne and Samhat suggest that some of the more promising extensions of participation and publicity have occurred on environmental issues, notably in connection with the Global Environmental Facility of the World Bank. Payne, Rodger A. and Samhat, Nayef H., Democratizing Global Politics (Albany, N.Y.: State University of New York Press, 2004). 11 See, among many others, Archibugi, Daniele, The Global Commonwealth of Citizens: Toward Cosmopolitan Democracy (Princeton, N.J.: Princeton University Press, 2008); Bohman, James, Democracy Across Borders: From Dêmos to Dêmoi (Cambridge, Mass. : MIT Press, 2007); Robert E. Goodin, “Global Democracy: In the Beginning” (paper presented at the Annual Meeting of the American Political Science Association, Boston, August 28–31, 2008); Held, David, Democracy and the Global Order: From the Modern State to Cosmopolitan Governance (Cambridge: Polity Press, 1995); Keohane, “Accountability in World Politics”; Kuper, Andrew, Democracy Beyond Borders: Justice and Representation in Global Institutions (Oxford: Oxford University Press, 2004); Macdonald, Terry, Global Stakeholder Democracy: Power and Representation Beyond Liberal States (Oxford: Oxford University Press, 2008); Marchetti, Raffaele, Global Democracy: For and Against (London: Routledge, 2008); Payne and Samhat, Democratizing Global Politics; and Thompson, Dennis, “Democratic Theory and Global Society,” Journal of Political Philosophy 7 (1999), pp. 111–25. See also Millennium 37, no. 3 (May 2009), the special issue on “Interrogating Democracy in International Relations”; the symposium in Ethics & International Affairs 24, no. 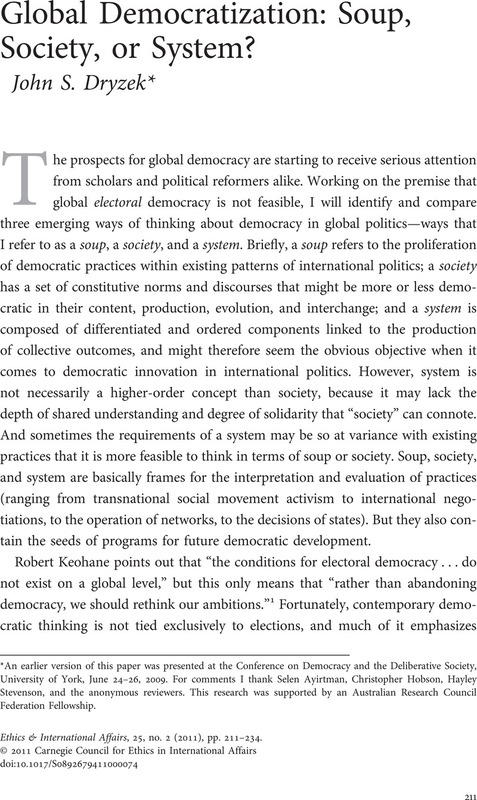 1 (March 2010), on “Global Democracy”; and the special section on “Deliberation and Global Governance” in Review of International Studies 36, no. 2 (April 2010). 12 Keck, Margaret E. and Sikkink, Kathryn, Activists Beyond Borders: Advocacy Networks in International Politics (Ithaca, N.Y.: Cornell University Press, 1998). 13 Saward, Michael, “Authorization and Authenticity: Representation and the Unelected,” Journal of Political Philosophy 17 (2009), pp. 1–22. 14 Macdonald, Global Stakeholder Democracy. 15 Dryzek, John S., Bächtiger, André, and Milewicz, Karolina, “Toward a Deliberative Global Citizens' Assembly,” Global Policy (forthcoming, 2011). 16 Stiglitz, Joseph, Globalization and Its Discontents (New York: W. W. Norton, 2002), p. 20. 17 Braithwaite, John and Drahos, Peter, Global Business Regulation (Cambridge: Cambridge University Press, 2000). 18 Hendriks, Carolyn M., “The Democratic Soup: Mixed Meanings of Political Representation in Governance Networks,” Governance 22 (2009), pp. 689–715. 19 Saward, Michael, “In Place of ‘Global Democracy,’” Ethical Perspectives 15 (2008), pp. 507–26. 21 Rosenau, James N., “Governance and Democracy in a Globalizing World,” in Archibugi, Daniele, Held, David, and Köhler, Martin, eds., Re-Imagining Political Community: Studies in Cosmopolitan Democracy (Cambridge: Polity Press, 1998), p. 32. 23 Lidskog, Rolf and Elander, Ingemar, “Addressing Climate Change Democratically: Multi-Level Governance, Transnational Networks and Governmental Structures,” Sustainable Development 18, no. 1 (2010), p. 39. 25 Keohane, “Accountability in World Politics,” p. 79. 27 See Barry, Brian and Hardin, Russell, eds., Rational Man and Irrational Society? (Beverly Hills, Calif.: Sage, 1982). 28 Early in the cold war, Hans Morgenthau flirted with the idea of a world government to control states armed with nuclear weapons. While classical realists such as Morgenthau had no interest in democracy, presumably such a government could have been more or less democratic. 29 Keal, Paul, “An ‘International Society’?” in Fry, Greg and O'Hagan, Jacinta, eds., Contending Images of World Politics (Basingstoke, UK: Macmillan, 2000), pp. 61–75; and Hurrell, Andrew, On Global Order: Power, Values, and the Constitution of International Society (Oxford: Oxford University Press, 2007). 30 Bull, Hedley, The Anarchical Society, 3rd ed. (Basingstoke, UK: Palgrave Macmillan, 1977). For Bull, society was a higher-order concept than system, because an international system meant only interaction between states, while society entailed a normative order that bound states. “System” as developed in deliberative terms in the next section involves much more than Bull's limited usage of the term. 31 Mayall, James, “Democracy and International Society,” International Affairs 76, no. 1 (2000), p. 67; see also Clark, Ian, “Democracy in International Society: Promotion or Exclusion?” Millennium 37, no. 3 (2009), pp. 563–81. 32 Mayall, “Democracy and International Society,” p. 64. 33 Macdonald, Global Stakeholder Democracy. 34 Buzan, Barry, From International to World Society? English School Theory and the Social Structure of Globalisation (Cambridge: Cambridge University Press, 2004), p. 28. 35 Ruggie, John G., “What Makes the World Hang Together? Neo-Utilitarianism and the Constructivist Challenge,” International Organization 52 (1998), pp. 855–87; Wendt, Alexander, Social Theory of International Politics (Cambridge: Cambridge University Press, 1999); and Reus-Smit, Christian, The Moral Purpose of the State: Culture, Social Identity, and Institutional Rationality in International Relations (Princeton, N.J.: Princeton University Press, 1999). 36 Habermas, Jürgen, The Theory of Communicative Action I: Reason and the Rationalization of Society (Boston: Beacon Press, 1984). 37 Habermas, Jürgen, Between Facts and Norms: Contributions to a Discourse Theory of Law and Democracy (Cambridge, Mass. : MIT Press, 1996). 38 Risse, Thomas, “‘Let's Argue!’ Communicative Action in World Politics,” International Organization 54 (2000), pp. 1–39. See also Müller, Harald, “International Relations as Communicative Action,” in Fierke, Karin M. and Joergensen, Knud Erik, eds., Constructing International Relations: The Next Generation (London: M. E. Sharpe, 2001). 39 Crawford, Neta C., “Homo Politicus and Argument (Nearly) All the Way Down: Persuasion in Politics,” Perspectives on Politics 7 (2009), p. 105. 41 Linklater, Andrew, The Transformation of Political Community: Ethical Foundations of a Post-Westphalian Era (Cambridge: Polity Press, 1998), p. 92. 42 Habermas, Jürgen, The Divided West (Cambridge: Polity Press, 2006), p. 143. 43 Cochran, Molly, “A Democratic Critique of Cosmopolitan Democracy: Pragmatism from the Bottom Up,” European Journal of International Relations 8 (2002), pp. 517–48. 44 Finnemore, Martha and Sikkink, Kathryn, “Taking Stock: The Constructivist Research Program in International Relations,” Annual Review of Political Science 4 (2001), p. 400. 45 Payne and Samhat, Democratizing Global Politics, p. 6. 46 Beck, Ulrich, Risk Society: Towards a New Modernity (London: Sage, 1992). 47 Dryzek, John S., Deliberative Global Politics: Discourse and Democracy in a Divided World (Cambridge: Polity Press, 2006). 48 See also Eriksen, Erik O., The Unfinished Democratization of Europe (Oxford: Oxford University Press, 2009). 49 Marchetti, Global Democracy; and Tännsjö, Torbjörn, Global Democracy: The Case for a World Government (Edinburgh: Edinburgh University Press, 2008). 50 Held, Democracy and the Global Order; and Archibugi, The Global Commonwealth of Citizens. 51 Mansbridge, Jane, “Everyday Talk in the Deliberative System,” in Macedo, Stephen, ed., Deliberative Politics (Oxford: Oxford University Press, 1999), pp. 211–39. 52 Goodin, Robert E., “Sequencing Deliberative Moments,” Acta Politica 40 (2005), pp. 182–96. 53 Parkinson, John, Deliberating in the Real World: Problems of Legitimacy in Deliberative Democracy (Oxford: Oxford University Press, 2006), pp. 166–73. 54 Hendriks, Carolyn M., “Integrated Deliberation: Reconciling Civil Society's Dual Role in Deliberative Democracy,” Political Studies 54 (2006), pp. 486–508. 55 Neblo, Michael, “Thinking Through Democracy: Between the Theory and Practice of Deliberative Politics,” Acta Politica 40 (2005), p. 178. 56 Thompson, Dennis, “Deliberative Democratic Theory and Empirical Political Science,” Annual Review of Political Science 11 (2008), p. 515. 57 Habermas, Jürgen, Structural Transformation of the Public Sphere: An Inquiry into a Category of Bourgeois Society (Cambridge, Mass. : MIT Press, 1989). 58 As described in Braithwaite and Drahos, Global Business Regulation. 59 Keane, John, “Democracy Failure,” On Line Opinion, posted April 20, 2009; available at www.onlineopinion.com.au/view.asp?article=8807. 60 Litfin, Karen, Ozone Discourses: Science and Politics in Global Environmental Cooperation (New York: Columbia University Press, 1994). 61 Robert Watson, quoted in ibid., p. 111. 62 See, e.g., Ikenberry, G. John and Slaughter, Anne-Marie, Forging a World of Liberty under Law: U.S. National Security in the 21st Century (Princeton, N.J.: Woodrow Wilson School, 2006); and Lindsay, James M., “The Case for a Concert of Democracies,” Ethics & International Affairs 23 (Spring 2009), pp. 5–11. 63 Held, Democracy and the Global Order, p. 22. * An earlier version of this paper was presented at the Conference on Democracy and the Deliberative Society, University of York, June 24–26, 2009. For comments I thank Selen Ayirtman, Christopher Hobson, Hayley Stevenson, and the anonymous reviewers. This research was supported by an Australian Research Council Federation Fellowship.